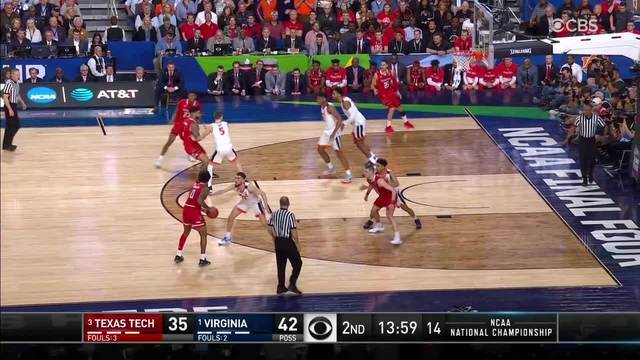 Virginia is your 2019 national champion. The Cavaliers beat Texas Tech by a score of 85-77 in overtime and officially squashed their NCAA tournament demons. Here are three quick takeaways from Monday night's game. Virginia was in control for most of the night. Then Texas Tech stormed back. Then the two traded blows through the last five minutes of regulation and overtime. In the end, Virginia prevailed. Looking at this matchup before the game, there was no obvious weakness to exploit on either side. Texas Tech had guys to guard De'Andre Hunter, even though he wound up going off (more on him soon). Virginia had the bodies to contain Jarrett Culver. The Cavaliers won the rebounding battle, but not by much. The Red Raiders won the turnover battle, but not by much. 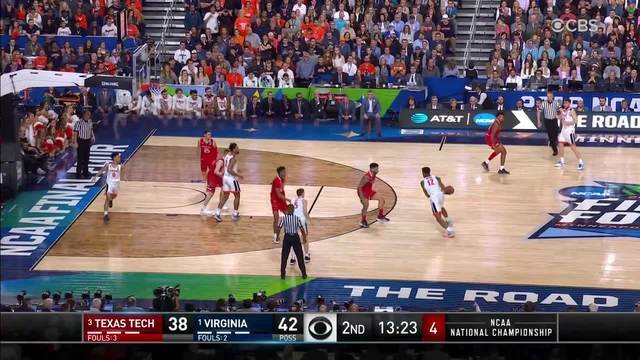 Virginia shot a higher percentage from the floor, but – you guessed it – not my much. At the end of the day, Virginia's top three guys just played better than Texas Tech's top three. Hunter, Ty Jerome and Kyle Guy combined for 67 points. Culver, Davide Moretti and Matt Mooney combined for 45. That was the biggest difference in the game. But these were both national title-caliber teams. Culver didn't hit his first field goal until midway through the second half, and Hunter was on him most of the night. And it's probably no coincidence that Culver's first two buckets came when he baited a switch, scoring on Braxton Key and Jerome instead of Hunter. This was the matchup to watch coming into the night, as both guys are projected NBA lottery picks. Hunter got off to a slow start, but was dominant in the second half on both ends. He finished 8-of-16 shooting for 27 points. His defense against Culver is what really stood out. Culver just couldn't get around him. Hunter has about 30 pounds and a few inches on him, but it was an awfully impressive effort regardless; Culver is used to getting to his spots whenever he feels like it. Their quickness looked similar, but Hunter's size advantage was crucial. Don't overlook his technique, either. This isn't the only reason why Virginia won. But it was a significant reason. Culver is still an excellent player, but Hunter was simply better on Monday night. Both teams played – and more notably, shot – quite well! This was branded as a defensive struggle coming in, and for the first few minutes it looked like a sport, well, other than basketball. But once Virginia and Texas Tech settled in, the offenses started clicking. These teams play at a slow pace, so there were never going to be a ton of points. But they are efficient. The Cavaliers and Red Raiders both rank in the top 15 of offensive efficiency, per KenPom. And there were certain stretches where both teams were raining 3s. Virginia made 11 3s, while Texas Tech made 10. Shout out to the Red Raiders' bench, by the way. Texas Tech wouldn't have even come close if not for Brandone Francis and Kyler Edwards, who combined for 29 points. Guy's clutch performance against Auburn carried into Monday night's game. The junior hit four 3s and finished with 24 points, while Jerome was his usual steady self. Neither team looked like the Seven-seconds-or-less Phoenix Suns, but this wasn't the rock fight many anticipated.